The Forgotten Oil and Gas Study, a new package built on robust statistical analysis of data from within GOM3, is now available in the Aug. 4th edition of Oil & Gas Journal. 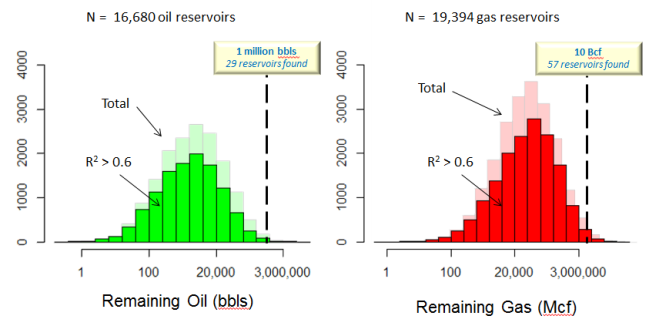 The study identifies the remaining producible oil and gas in all Gulf of Mexico reservoirs abandoned before 2010 based on well know decline curve analysis on the entire GOM. The original article can be downloaded here: PDF of article. The Oil & Gas Journal article can be accessed on their website if you have a subscription: Volume 113, Issue 8. The 9th Annual User Conference will be held on Thursday, October 30, 2014 in the Memorial City area of Houston. As always this event will present enhancements from the past year, particularly the development of the next generation of GOMsmart (for phones, tablets and beyond) and the storm analysis work, as well as future plans. The conference is intended for geologists, geophysicists, engineers, land specialists, GIS professionals/techs, and managers. The exchange of ideas and directions for our future development are still the top priority of the conference; we will continue to aim for the informality and small size of past years. Registration is free, though limited, but we will do our best to accomodate those who wish to attend. More information will be included in newsletters in upcoming weeks. To attend the conference, please click here to register.. There is still time to submit a proposal for a presentation at the conference. Contact us here with your ideas.